Home Costs > How Much Do Church Pews Cost? How Much Do Church Pews Cost? Church pews are either long benches or an enclosed box used primarily for seating people during a church session. How much does a church pew cost? On average, a new church pew can cost anywhere from $200 to as much as $2,000 per pew. The costs will depend on the size, construction and the ends. According to UsedPews.org, they say you should budget about $50 to $60 per foot for a brand new padded church pew. As for purchasing a used church pew, the costs can be in the $30 to $175 range, depending on the age. According to Religious Product News, the average used church pew will be about 20+ years old and will have some noticeable wear and tear. If you were to purchase used, the website says you should not pay more than $50 or else it’s considered a ripoff. For example, at the time of this writing, we had found churches across the United States selling pews for $75 to $250 per pew, and many churches were willing to throw in the pulpit, communion table and pulpit chairs into the purchase. Keep in mind that some vintage/antique pews could be a lot more, especially if rare. Church pews will often be made of a solid wood such as a cherry, oak or maple, and the two most popular types you may find will include either an upholstered pew or a wood finished pew. The seat can either be upholstered on the front and rear or the seat may be upholstered with a solid wood backing. 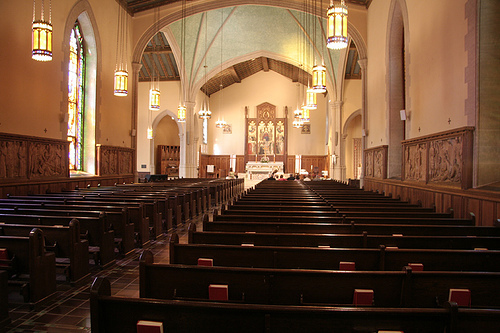 Some pews may not be upholstered at all, with the entire pew made of a solid wood. The difference between the two will be wood being used. If no upholstery is required, then this could mean more hand-crafted labor will need to go into the process, increasing the price. If the pew is going to be upholstered on most of the bench, then the wood beneath the fabric won’t have to be finished. Pew ends, also can come in the following forms: as a traditional, cantilever, colonial or standard edge. These ends can come in a variety of finishes and will enhance the beauty of the pew. If purchasing new, you will be able to choose the wood the pew is made from, the wood finish, the pew end design and the fabric the pew is constructed of. Custom orders will often take 10 to 14 weeks to construct. Due to the pew sizes, special transportation may be needed to pick them up at the designated location. The same can be said about shipping charges if you were to purchase them online. Kneelers, a common accessory commonly added to a church pew, can be an additional cost to consider. Buying used will almost always save you thousands of dollars, and these used pews can be found on Craigslist, through third-party retailers or even eBay. If you’re lucky enough, you may be able to find a church closing down or even a church that may be upgrading their pews. If you want to purchase new, our research shows that upholstered church pews are actually the most inexpensive option since these cushions can hide most of the wood. As a general rule of thumb, the more wood the pew shows, the more it’s going to cost. Most of the used pew market is being sold by churches that have either closed or are upgrading their furniture. Since most are desperate to move their furniture to make way the new ones, they may be willing to drop the price they currently have listed. With that being said, don’t be afraid to haggle. Our church paid about $500 for our church that recently moved. We were able to acquire a discount since we paid for more than 10 at once.